Planes of Consciousness in the Nirvana Chakra. The Crown Centre is located at the top of the head, above the ears. In Tantra this is variously called the Sahasrara (Thousand Petalled lotus), the Nirvana, the Parabrahma (Supreme Godhead) or the Bodhini (Awakened Consciousness) Chakra, among other terms. In Tibetan Buddhism it is termed the wheel of great bliss and associated with the Swabhavakaya or Absolute Self-Nature; and in Taoism it is referred to as poetically as the One Hundred Meetings (Bai Hui), Kun Lun Mountain (the highest peak of heaven), or more pragmatically the back-of-the-crown point. This is the centre through which one connects to spiritual dimensions and planes of consciousness beyond and above the seperate individual self. Through it one receives revelations from higher planes of existence. Such revelations are the basis of genius, higher intuition, and genuine (as opposed to false lower emotional) religious experiences. Now, there is some confusion regarding the precise nature of this chakra, due to once again the fact that several different chakras are confused here. It should be noted that the Crown point does not correspond to the true Sahasrara chakra, as this is located some distance above the top of the head. Rather, it corresponds to a sort of secondary Sahasrara, which can be called the Nirvana Chakra, and which is represented as having one hundred rather than one the Sahasrara's traditional one thousand petals. In the Tibetan schema, the crown chakara however has only thirty-two spokes or petals, while the Theosophist Leadbeater describes it as having twelve primary and 960 secondary petals. It may well be that there are several different chakras here, occupying the same point in space..
Another name for the Nirvana chakra is the Brahmarandha chakra. At death, the spirit leaves the body through a tiny hole at the top of the head, called in Indian thought the Brahmarandha. Similarily in Taoist esoteric systems that teach the cultivation of an immortal spirit body, this body exits through the Crown Centre, in contrast to ordinary astral projection or out of body experience, which is normally through (or regulated by) the solar plexus centre. This chakra is usually described as being white (or shining white) in colour, although Leadbeater and Hills both describe it as more violet in hue. It may be that white corresponds to its higher or positive polarity, and violet to its lower polarity. 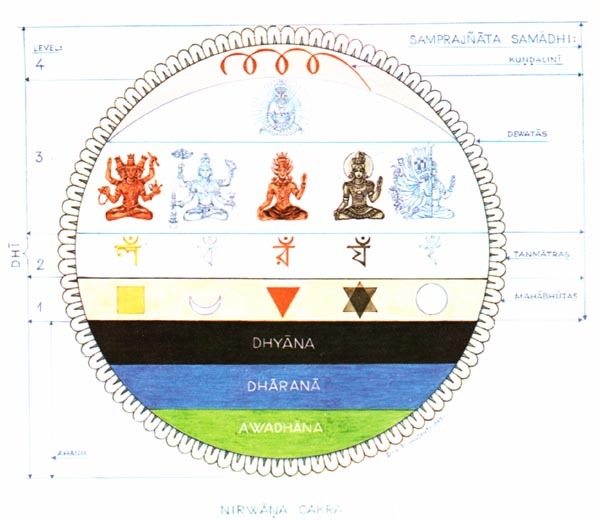 The complex grades of consciousness within the Nirvanana chakra. Table for Sahasrara Chakra 7. Sushumna terminates in talu-rnula (upper end of palatine region), also called brahmarandhra and dwadashanta, which is the topmost point within the cranium. This end-point of sushumna is marked by nirwana chakra, also called brahmarandhra and dwadashanta chakra. It's associated gland is the pineal, which regulates the body's internal clock, and was considered by the philosopher Descartes to be the link between the body and the soul. Ann Ree Colton locates in this chakra the "soul's pulsation" [The Third Music, p.***] and the halo or "luminosity-nimbus" of the soul's vibration around the head as it relates to the "higher unconscious" or superconscious, and which constitutes the middle sphere of spiritual evolution - the lower sphere being the ordinary ego-consciousness [The Third Music, pp.85-6 ]. In terms of the astrological sequence, the Crown Centre corresponds to the Saturn, the outermost of the traditional seven planets, and thus traditionally the limit between the individual and the transpersonal. Saturn's rather sombre quality represents the form and structure that defines the limits of the individual being. Significantly, it is through this centre that the consciousness leaves the body at death or (in the case of higher occult practices) during the transferrance to the immortal spirit body. In fact Saturn's negative image may well be culture-relative. In Chinese thought the planet corresponds to the "element" Earth (somewhat equivalent to "spirit" in the West), the central position, the colour yellow, and with the positive attribute of fairness and openness. This centre also corresponds in part to the Sefirah Keter or Crown, which represents the Godhead (or at least the first manifestation thereof), and which in Qabalah is usually associated with the planet Neptune. In order to maintain the sequence of planets along the Governing Channel however, I have placed Uranus here, after Saturn, and Neptune with the Forehead Chakra. It is suggested that when the Crown Centre is open, one is automatically drawn to mystical or occult teachings. Spirituality is spontaneous and is defined through unique individual experience - an inner knowing or gnosis - rather than external dogma or religion. One may also see auras and receive guidance from higher forces, or there may be a visionary or creative Imagination, or an awareness of and identification with an enduring cosmic order, or a sense of joyful awe and wonder at the cosmos, or a sponataneous inner understanding of Universal Truths and a sense of purpose and meaning in existence. Conversely when this centre is blocked on the other hand, all sense of the spiritual and the creative is blocked as well (because all these things come ultimately from above), and the person will tend to have a very narrow, limited consciousness. They may be an absolute materialist, or, even worse, belong to some fundamentalist religion or ideology, or they may simply have no sense of, or interest in, realities beyond the mundane, or beyond what they can understand.